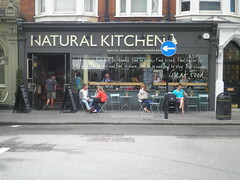 Marylebone High Street branch of the Natural Kitchen cafe/delicatessen chain (there are others in Fetter Lane and Tower Hill). The emphasis is on seasonal, organic and (mostly) healthy food. This branch has a large salad counter, in a similar setup to Planet Organic: here you can choose from a large number of vegetarian salad fillings, plus an optional cold 'main' (quiche, falafel, grilled chicken breast, poached salmon etc). The salads are not labelled but the staff are happy to answer questions about any mysterious ingredients. There is also a fridge with ready-made sandwiches and wraps. On Kat's visit in February 2013, a small takeaway box with three veggie salad combinations (lentils & raw carrot, halloumi & pearl barley, pesto pasta) was £6. This seemed reasonable for the area and the quality of the ingredients. There is a cafe area at the front (plus a few tables outside on Marylebone High St), which can get very busy at lunchtimes with local office workers and families. As well as food from the counter, there is a hot food menu featuring an all-day brunch. The rest of the shop stocks the usual upmarket deli foods, but there is also a fresh meat counter and a few interesting wines and bottled beers on display (as I was buying my salad box, the staff took delivery of a huge stack of different beers from the Hook Norton brewery). There is also a separate restaurant area upstairs with table service. On Kat's Thursday lunchtime visit in January 2014 it was almost full at 1pm. A goat cheese salad with beetroot and walnuts (quite expensive, at £13) was delicious — well-dressed, and a generous portion. Service was friendly and efficient. Accessibility: toilets are located down a wide staircase as you head towards the back of the shop. A lift serves all three levels. Last visited by Kat, January 2014. Opening hours taken from the Natural Kitchen website, February 2014. Last edited 2014-02-02 14:35:35 (version 9; diff). List all versions. Page last edited 2014-02-02 14:35:35 (version 9).